Wow! Those are great. And I feel you about the whole wallet situation. Eh. Looks like I'm skipping the Ant-Man wave. Nothing of real interest there. A pity. If they'd done the female Yellowjacket from the Guardians of the Galaxy, I'd've bought her in a heartbeat. Is this not a BaF? Is it a set? Its the Amazon set Jhiaxus mentioned a few pages back. The Entertainment Earth exclusive Guardians of the Galaxy (comic version) 5-pack is up for preorder. The Thanoa wave is at the Target next to where i work. I wish i could find that Spider-man 2099. All i see is basic Spidey, Anti-Venom and the 2 Spider-girls. I almost bit yesterday and bought the new Avengers to replace my 4 inch collection so they could be in scale with the SHIELD 3 Pack and my GotG figures. It would be way too expensive for me and I decided against it. I placed Maria, Coulson, and Fury in my display and I actually was okay with it. Happy I resisted and saved some money for stuff I actually need. ^_^ Just a story of restraint for those who may be finding it hard to not buy everything. 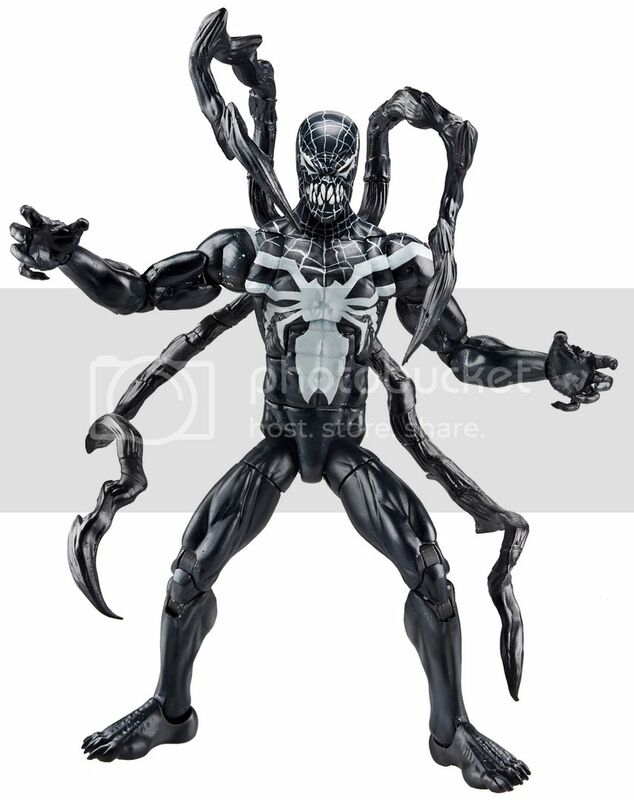 The figure I'm very excited for is Superior Venom. He comes with the back arms, so I'm very much considering buying this now so my Superior Spider-Man Mark II will have his Mech arms, too. Do you mean Agent Venom? Because my Walgreens have TONS of him. Oooh gotcha. I haven't read Superior Spider-Man yet, i want to start at the beginning of Slotts run on Amazing. Only recent Spider-man books i've read are Venom, Spider-Gwen, and some of Stracynskis old run. Grabbed me a Spider-Man at Wal-Mart. He was the only one from the Spider-Man set there. I was also wanting to get 2099, but at least I found one I was searching for. I grabbed Spider-man, Agent Venom, Black Cat, and an older Series VI Phoenix while i was out today. If there's anybody here that needs Black Cat or Agent Venom there is 1 of each left at my Walgreens (they've been keeping the shelves warm for a while, i just finally decided to grab a pair). Has anyone seen Spider-man 2099? (besides Kylash327) It seems to be the only one i can't find. Spider-Woman (both), Spider-girl (both), Superior Spider-man, the new Amazing Spider-man and Anti-Venom are all lining my shelves. But no 2099. I saw him at an FYE when I got my Daredevil. The employees were taking random new product out of boxes, and those were the only two Marvel Legends in there. I already have one, and ive seen a couple of them lately at target and walmart. Did some looking today. No 2099.